How to get there: A good beginning is to travel to Padang on the west coast of Sumatra in Indonesia. Padang has a new airport (north of town, location S00:47.050, E100:17.378) with connections to Jakarta (on Java) as well as to Singapore. From Padang it takes at least 7 hours of (fast) driving to reach the small village of Kersik Tua. 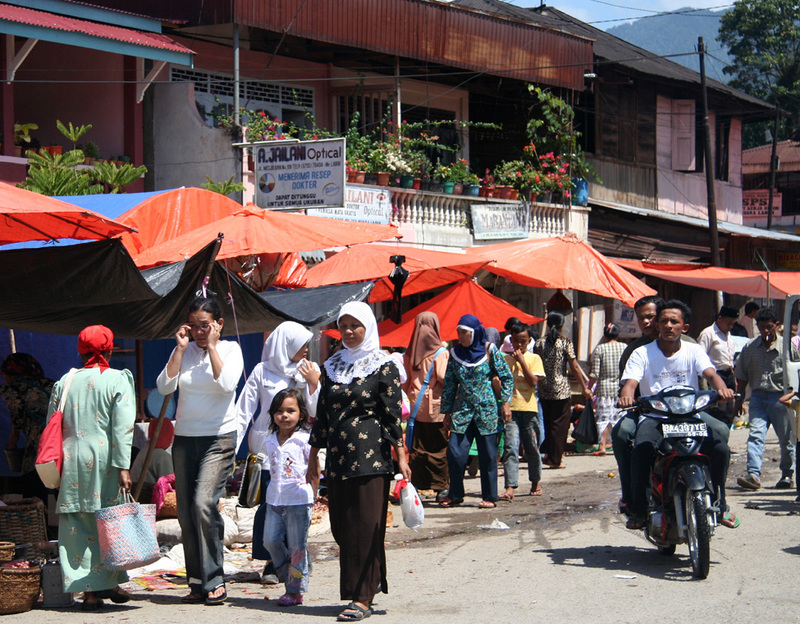 Padang is a large city with many "modern" hotels. We set up "base camp" at the very special "Paradiso Village" on the island Cubadak, about two hours travel south from the new Padang airport. This place is only 50 km (as the crow flies) from the airport, at location S01:13.013, E100:23.985, but the road is considerably longer. If you plan to combine the climb of Kerinci with some "sea and sun" plus a friendly Italian host serving delicious, family style dinners, then this can be strongly recommended. There are two routes from Padang to Kersik Tua, one inland, while one first runs south along the coast, then turns inland. The coastal route is quicker, in particular, (as we did) if you start from a point south of Padang. The best option is likely to hire a car with a driver that knows the way. I paid 70 (US) dollars per day for this, the driver would then pay for gasoline as well as his own accomodation. 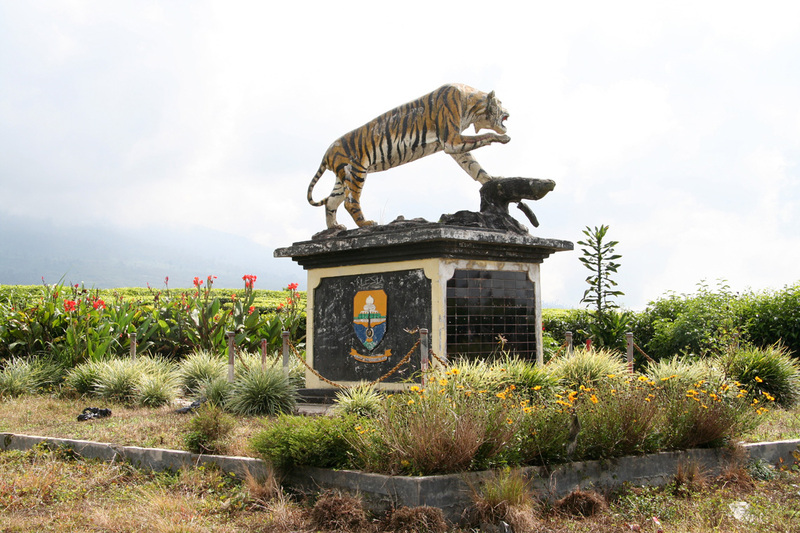 Once you arrive in Kersik Tua, locate a big statue of a tiger next to a road that heads towards the Kerinci. This intersection has location S01:46.554, E101:16.985 and the elevation is 1518 meter. 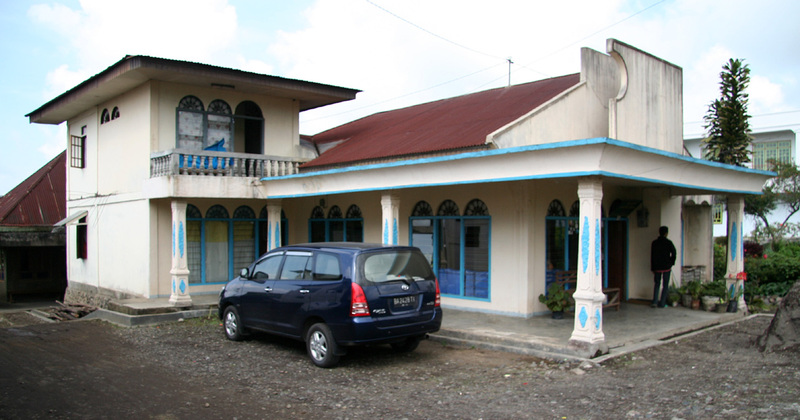 Diagonal across from the tiger statue, you will find the white and blue house of Mr. Subandi. He can provide accommodation as well as information about the national park. 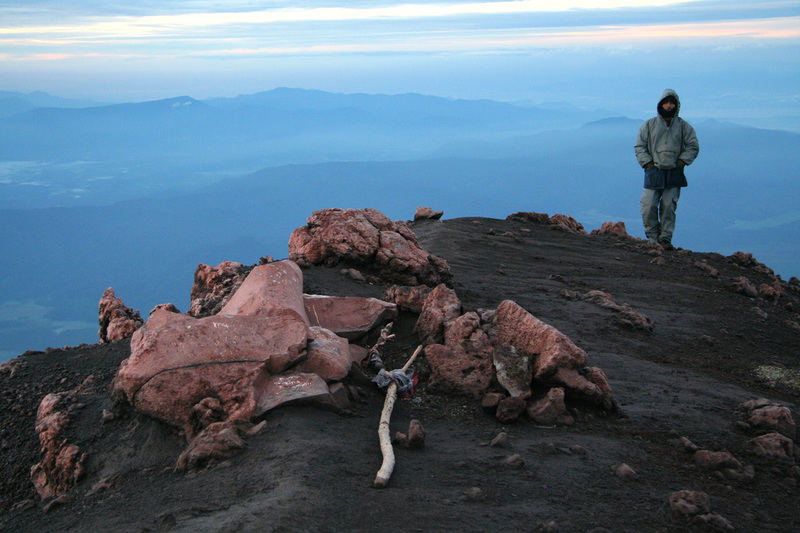 He also organizes porters and guides for climbing the summit. From Kersik Tua, the paved side road "guarded by the tiger statue", runs gently uphill for about 5 kilometer to the trailhead located at S01:45.095, E101:15.582, elevation 1762 meter. 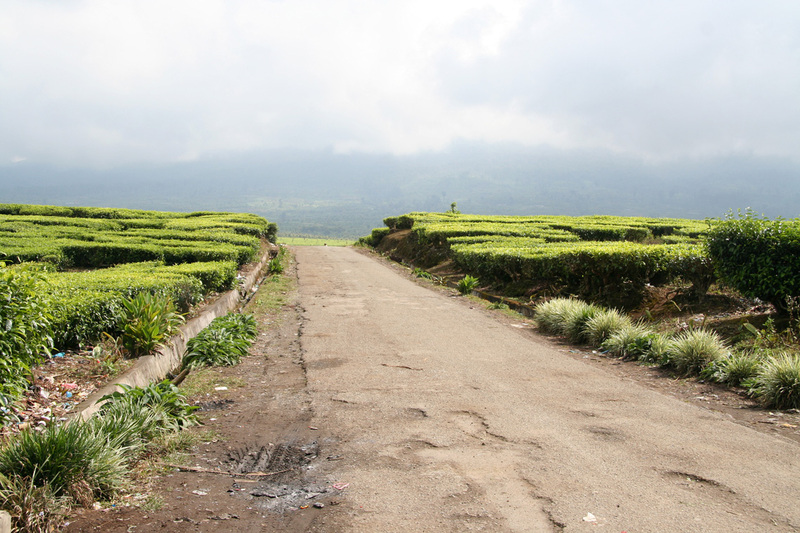 This road serves local farmers and fields of tea plants, as well as many other agriculture products are growing in the fertile soil below Kerinci. Route description: From the trailhead, continue uphill along a straight line that aligns with the direction of the road behind you. Follow the path as it runs along the edge of farming fields. There are a few different paths in this area, however the correct one runs straight uphill, the last section follows the left side of some farmed land before the trail enters the forest. Once in the forest, navigation becomes much easier in the sense that there is only one trail that can be followed. The trail soon starts to go uphill and fairly quickly you pass first one, then a second shelter. A shelter is some sort of roof, more or less in good shape. When you arrive at the third such shelter you are a little more than half way to the normal camp site before what normally is a next morning summit push. This trail is a truly jungle trail. For long periods you cannot see the sky and many sections are virtual "tree tunnels", narrow passages with dense vegetation on both sides as well as making a dense and almost always too low ceiling. 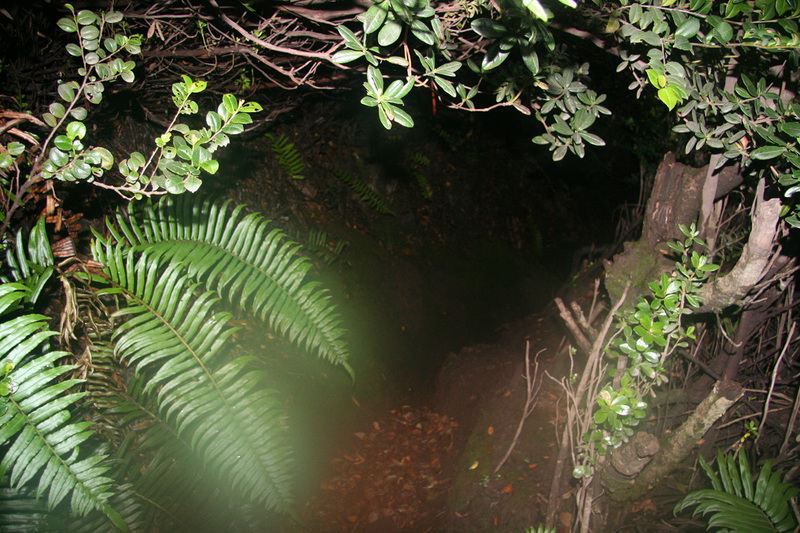 The trail is often a pretty narrow and deep trench that heads uphill. Some sections show that this also serve as a downhill path for water. The trench will have steeper sections where one either must climb up on the side or use roots and branches to tackle the steps directly. At about 3050 meter one should look for a trail that forks horizontally to the left while the main trail continues uphill. This trail leads (only a few meter long) to the traditional camp site. The precise location is S01:42.581, E101:16.066 , elevation 3064 m. The place is not particularly attractive, a grid of metal bars cover most of the level ground. Guides normally put up a plastic cover across these bars and then establish their tents below it. 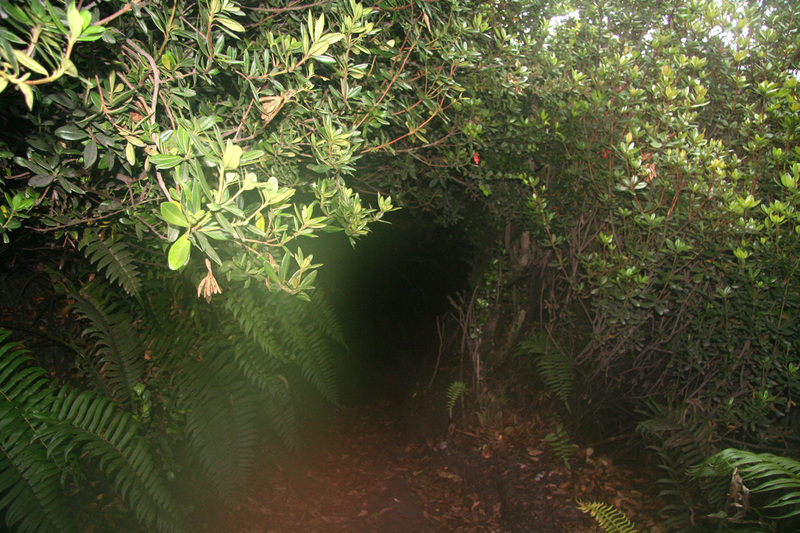 From the camp site, the trail continues uphill, mainly as a "tree tunnel" covering an often deep trench with numerous steep steps. To advance up here requires the use of hands, climbing, but never on rock, you hold onto roots, branches and small trees that grow along the side of the trench. 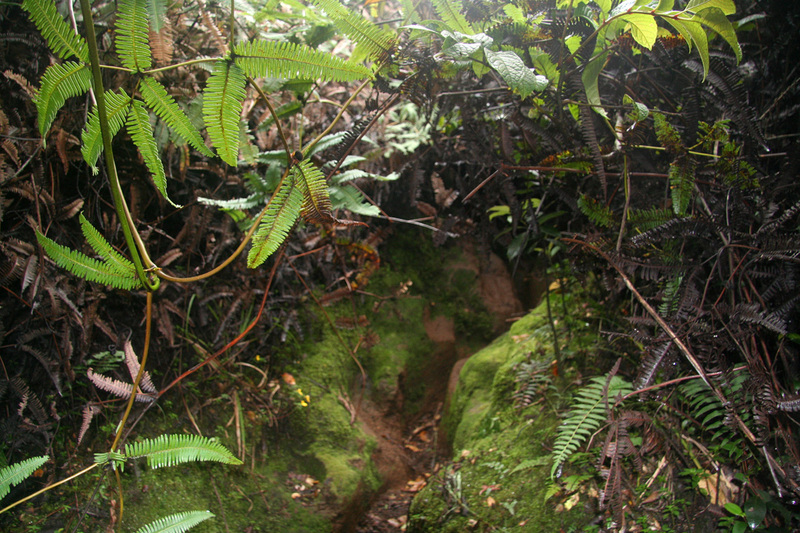 Gradually, the trail emerges from the extremely dense, but now low vegetation and out into more open terrain. You are on a pretty distinct ridge and there are numerous markers. Still, this is likely a point to track in order to be absolutely certain that you descend back into the jungle in the correct place. 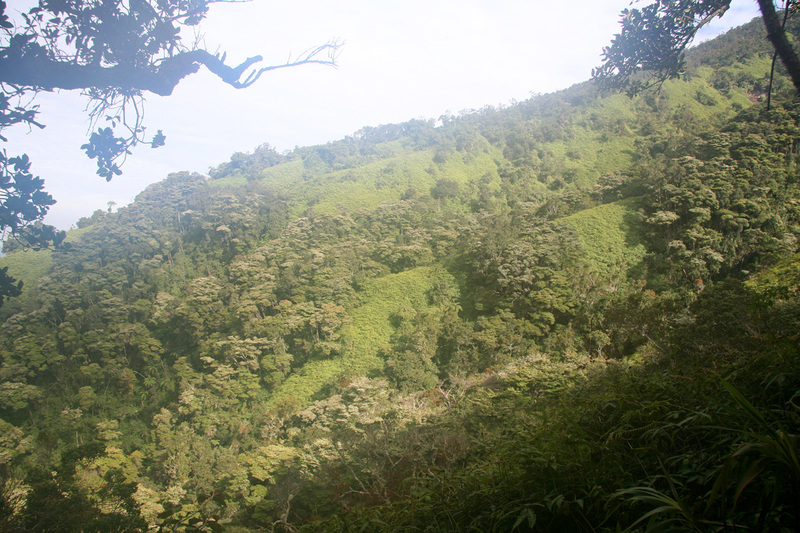 Location S01:42.344, E101:16.038 , 3301 m defines a trail entry point to the jungle, a bit higher at location S01:42.319, E101:16.025, elevation 3323 meter, the vegetation finally ends. Above here, there are several quite similar trails and paths. 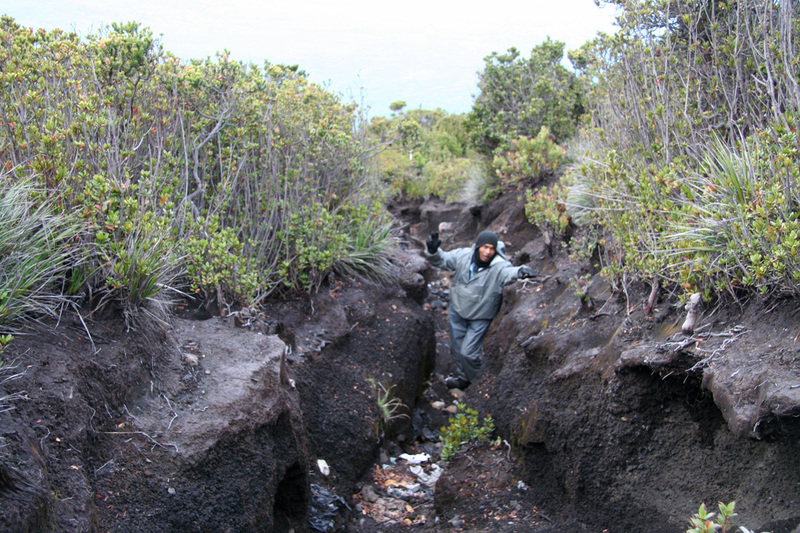 The best way is often to stay in the trenches that still lead uphill (picture taken while descending). There are some concrete markers and the trail is also marked by small pieces of rocks having a colored band tied around them. 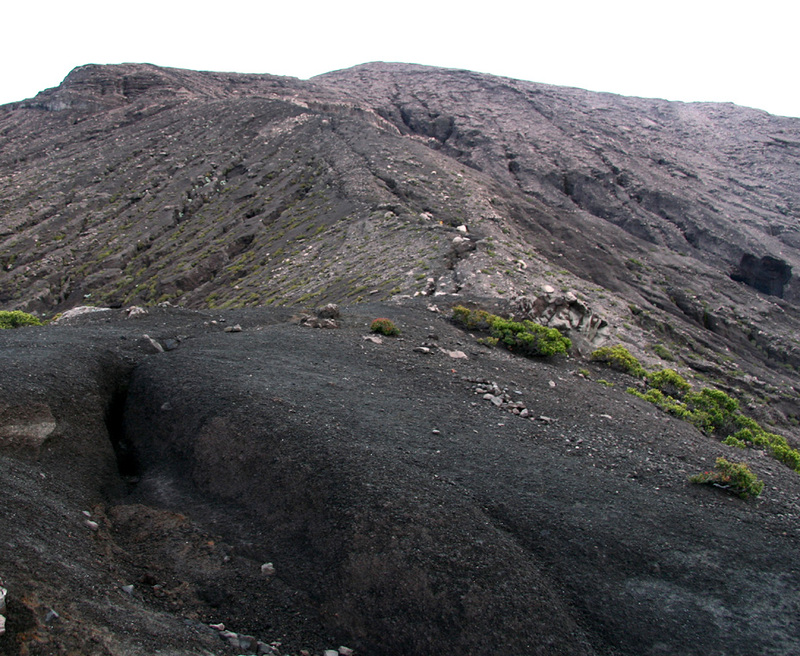 With visibility, the path is obvious, head more or less directly uphill towards the highest point. Soon you will arrive at the crater rim. 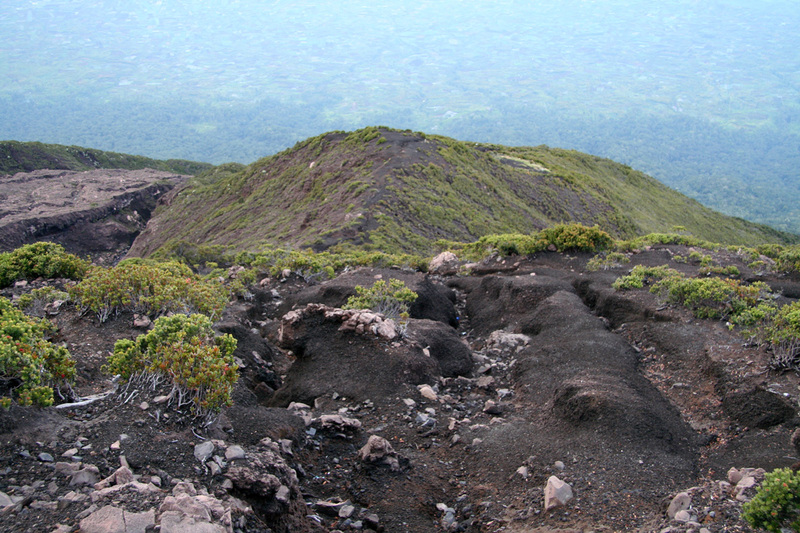 As with many volcanos, extreme care is needed near the crater edge as the rocks are loose and unreliable. This crater is very impressive and very deep. There is a sulphur lake at the very bottom, sulphur steam is coming up and there is a volcano "roar". The descent back to the trailhead must follow the ascent route. 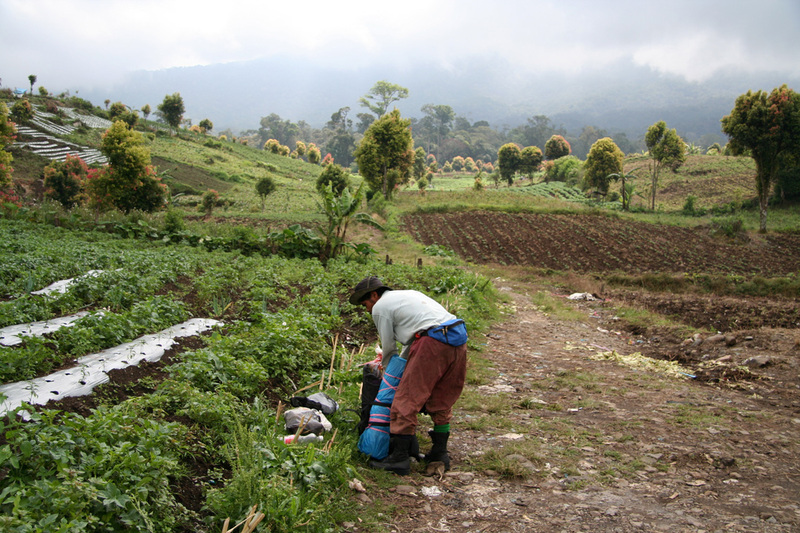 After a successful climb of Rinjani on Lombok, we travelled via Jakarta to Padang on the west coast of Sumatra. I had located an interesting (and little known) place called Paradiso Village on the island of Cubadak, this is about 50 kilometer south of the airport, but about a two hour travel by car and boat. Here, my wife would continue enjoying the sun and sea. It turned out that this place also ran a PADI diving school and we decided that Pål Jørgen should enroll in an intensive five day course to obtain the "Open Water Diving" certification. I did hike the island HP on the day of arrival, see this entry for more information and pictures. 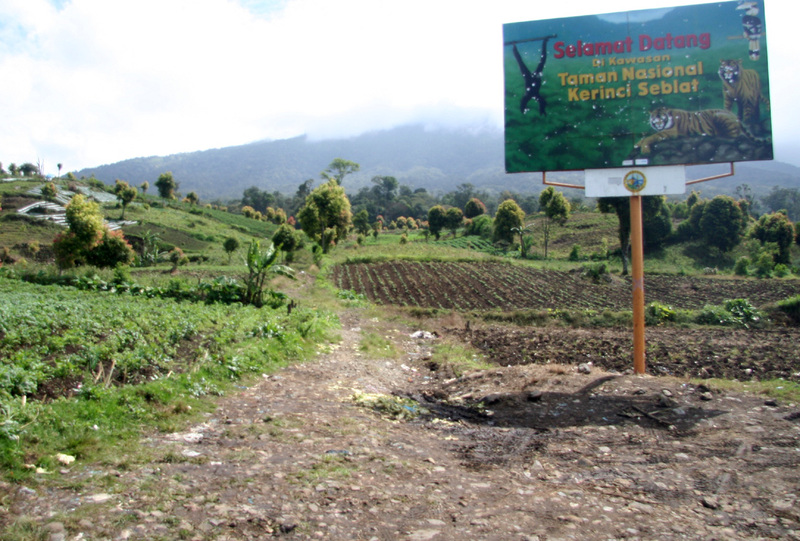 The drive from the coast to the village of Kersik Tua is long, but very worthwhile and interesting. 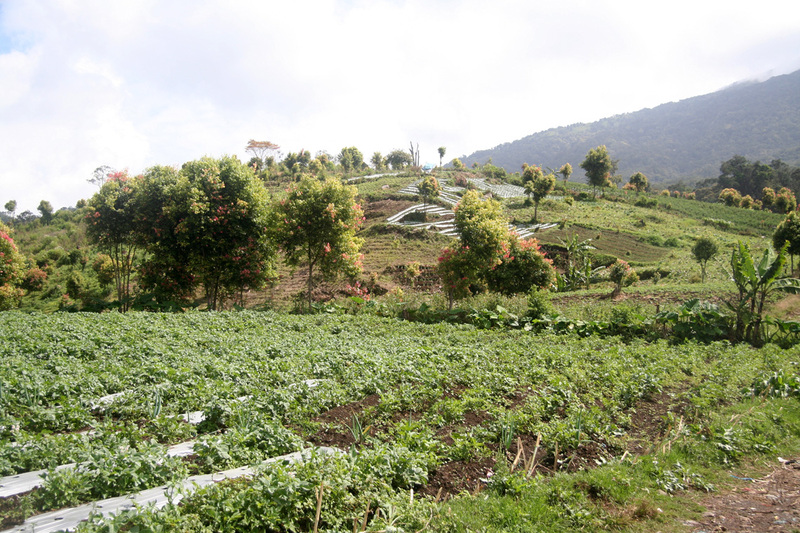 You can observe many different aspects of Sumatra, both landscapes and culture, along the way. There are people and houses along most of the road. The traffic is pretty chaotic with a large number of different means of transportation, the small motorbikes being in majority. It is not uncommon to see a complete family on one of these bikes, father, mother and two children. Dogs and chicken seem to always try a road crossing right in front of your vehicle, but surprisingly few are hit. A cars horn is used constantly to signal motorbikes about intended passing, to warn oncoming vehicles that may be behind (blind) sharp curves, to tell dogs and people to move further to the roadside etc. The signal lights are also in heavy use, the most common usage being to blink on the drivers side, sort of warning oncoming vehicles (that blink similarly) that this much of the road "is mine" and that there is a common responsibility to make sure that these two signal lights will clear each other when the two vehicles meet. I left the island of Cubadak around 0415, thus starting the drive at 0430. We arrived in Kersik Tua around 10 AM, about 5.5 hours of pretty fast driving. We quickly located the house of Mr. Subandi, he had a general reception area with a couple of posters about the national park on the wall. The guide that had been booked was clearly not ready and a wait was unavoidable. 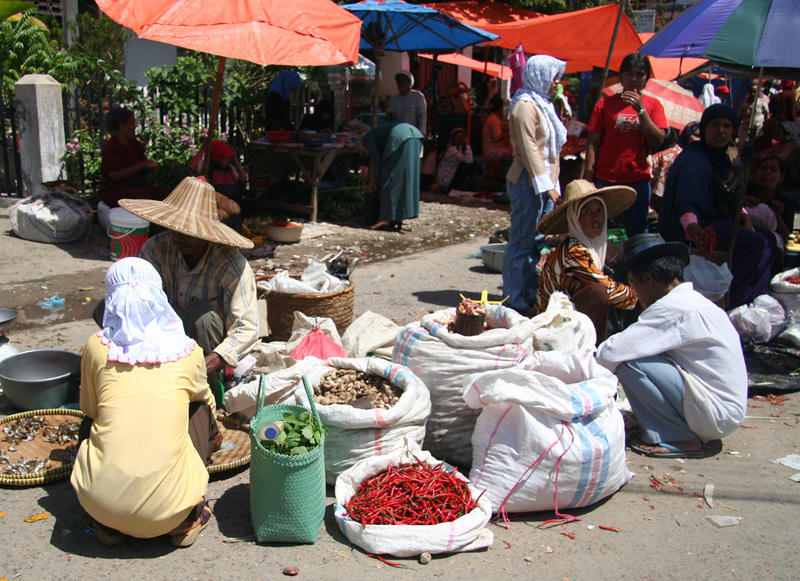 Again, a guide is strictly not needed, but at a cost of about US dollar 20 per full day, the contribution to local employment and the potential advantage of having the support of a local that speaks the language certainly is good value for money. While waiting, I talked to a girl from Belgium. She had a boyfriend interested in watching birds and he was later located along the trail in the lower section of the jungle. We were dropped at the trailhead at 1130 and I instructed the driver to come back and wait for me at this location starting at 12 noon the next day. My plan would be to then have ample time to reach the "Happy Hour" at Cubadak at 1900 the next evening and enjoy a good Italian/Indonesian dinner with my family. 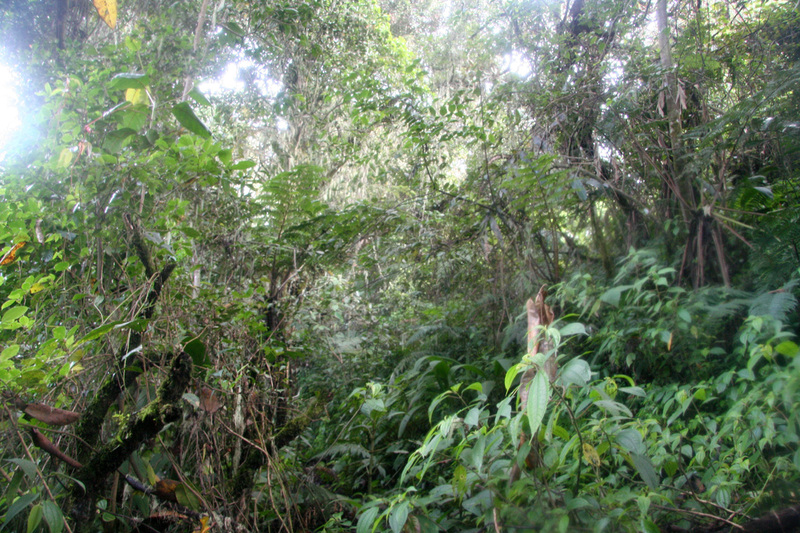 After a few minutes of hiking we were emerged completely in the jungle. This is the by far a denser and richer forest than anything I have hiked previously. The monkeys are far overhead shouting various characteristic signals to each other, presumably about our presence. I sit down on a log and wait for my guide, he appears after 5 minutes and says that I walk way too fast. After about 30 minutes of hiking, it started to rain. First a few drops, then more violent. Thunder and lightning as well. I guess a rainforest sort of needs this weather quite frequently. The thunder grew more aggressive, a couple of "flash-booms", with lightning right overhead. Initially, one realizes that most of the water (that now came by the buckets) is absorbed by the many layers of branches and leaves overhead, in fact, only a small fraction of the raindrops (if any?) finds the way to the ground without hitting the trees first. However, the trail that runs steeply uphill is often just a deep trench and obviously it has been made by running water just as much as by hikers. Tropical rain in a rainforest, I was soon soaked to the skin. The trail turned into a muddy creek and boots and socks quickly absorbed enough water and mud to blend perfectly with the stuff that came running from higher ground. The hike continues, but the next time I wait, the waiting time is more like 10 minutes. My guide is not a fast walker, his legs are short and that must be a disadvantage with the many fairly high steps in the trail. At the third shelter we overtake a group of 5 Czech hikers with a guide and two porters. 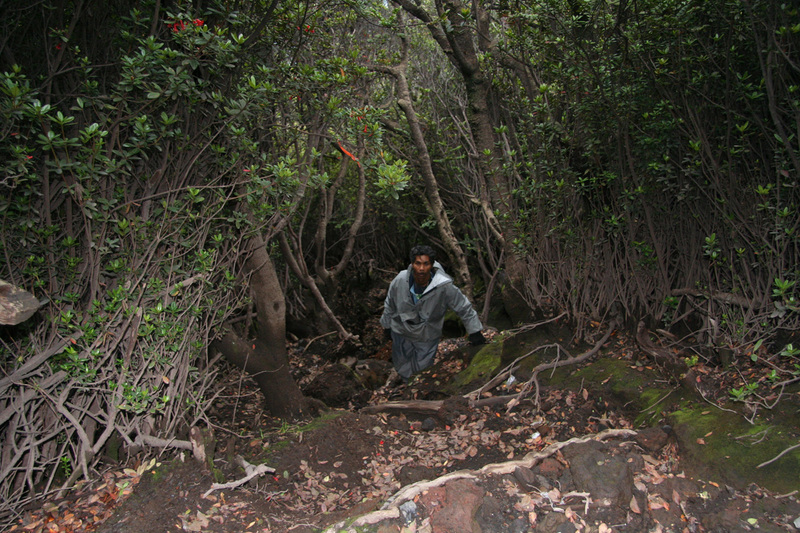 My guide eats his lunch and we continue uphill in the dense forest. We reach the campsite at 1515, however I have spent another 30 minutes waiting since we left the Czech party. Thus, a hiker in good shape should be able to complete this leg of the climb in 2 to 3 hours. 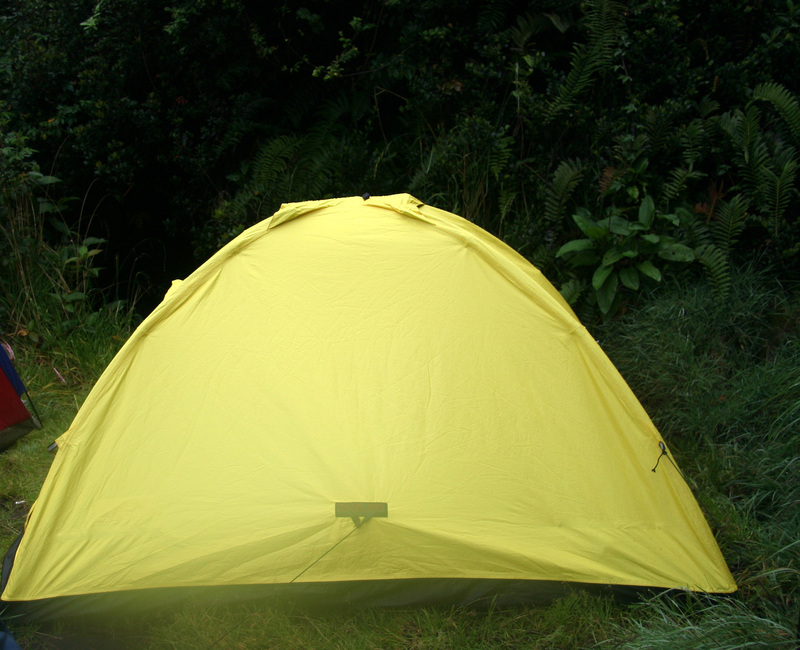 I pitch my tent, leave most of the wet cloths out in the rain (it rained about 8 hours! ), then crawl into my sleeping bag. I had ordered 20 pancakes from my Italian host on Cubadak, ten banana pancakes and ten normal. Thus, dinner as well as breakfast and lunch were planned to be pancake meals. I soon fell asleep, knowing that a reasonably early start the next morning would be appropriate. I got up at 0400, drank some of my water (it rained too much yesterday so my water bottle was still full) and had about 5 pancakes. It was pitch dark and many stars, no rain! I told the guide for the Czech party to tell my guide that I would be perfectly happy if he stayed in camp and watched my gear. Since my guide did not speak English (this was a small surprise), it was convenient to use the other guide as a go-between. It seemed to me that this message was delivered and agreed. I started out at 0415 with my warm Devold wool, a Swix trainer trouser and a soft shell fleece jacket. I decided to climb quite slowly, in order not to repeat the trouble on Rinjani with a summit arrival about one hour before sunrise. Also, go slow enough to avoid sweat and therefore prevent getting cold from lower temperature and possible wind near the summit. The trail was interesting, fairly direct uphill, long sections in a tunnel made from the trench and a dense cover of vegetation. In places this tunnel was too low and I had to bend down in order to not get stuck with the ceiling. In other places there could be about 2 meter near vertical sections best negotiated by climbing with roots as footholds and branches for handholds. I eventually emerged on a fairly distinct ridge where the vegetation ended and the slopes above consisted of rocks and scree. 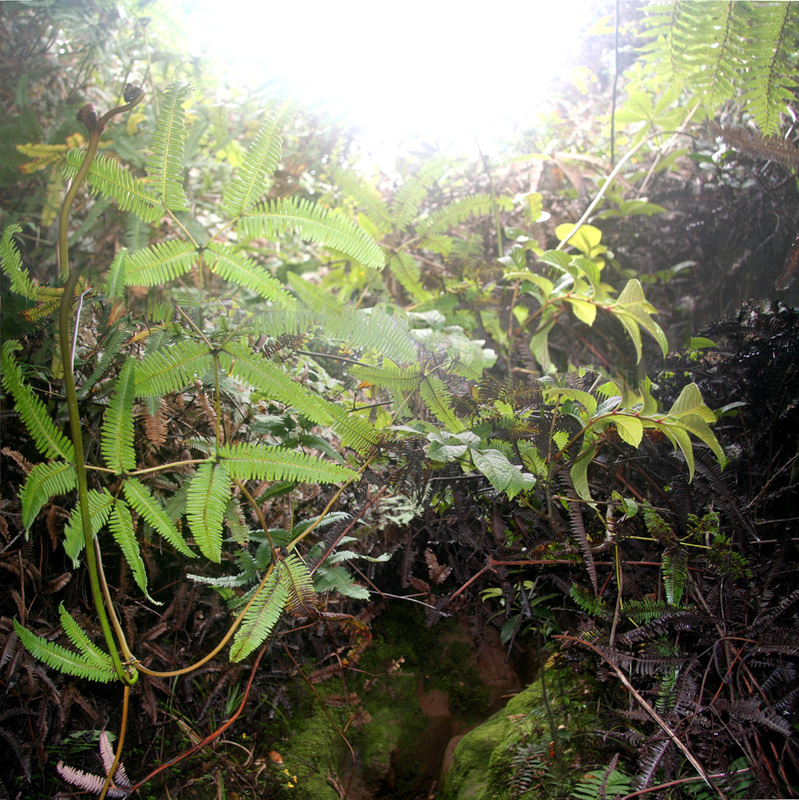 I took a GPS waypoints in order to be absolutely certain of finding the small hole that would serve as my return entrance back into the jungle. While doing this, I noticed a single flashlight further down and decided to wait to see who this was. As suspected, it turned out to be my guide. For one reason or other he had felt it necessary to follow after me. We continued as one party uphill. 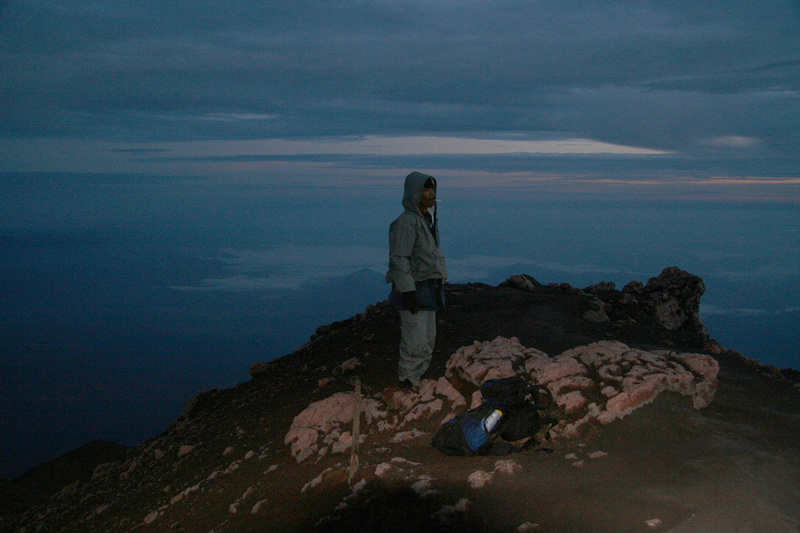 Higher up, he again fell a bit behind a normal pace and I summited at 0545, with him joining me closer to 0600. What an impressive crater! Much deeper than I had expected. 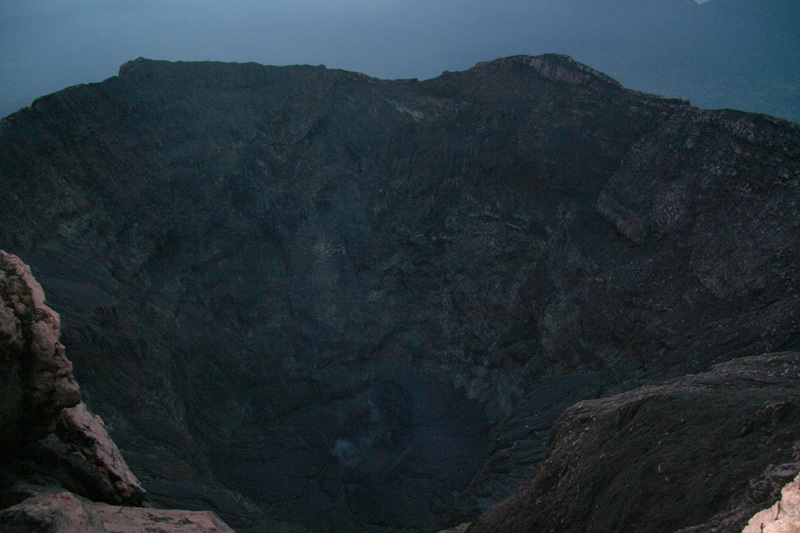 Several hundred meter deep and with a pretty complete, but jagged crater rim all around. Yet another place were one should be extremely careful when stepping close to the edge. It was still pretty dark and unfortunately, quite cloudy. The clouds in the east would largely block any sunrise. I walked a bit along the crater rim in both directions and took several pictures while waiting for the light to improve. My GPS showed 3808, ony 3 meter higher than the official elevation. 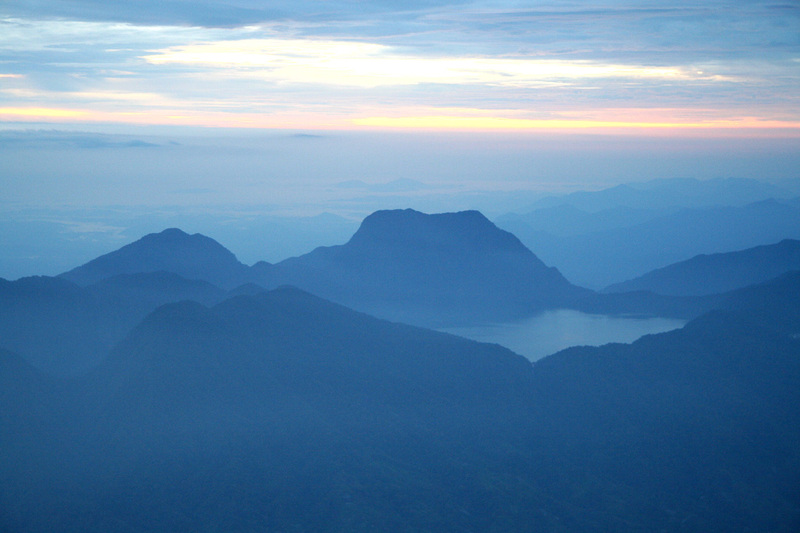 Eventually, at 0630, we started our descent back to camp. This took almost as long as my ascent, after five quarters of an hour we were back at the tent at 0745. I broke camp, chatted with the Czech porter (we met the Czech group while descending), then headed down the jungle trail at 0815. 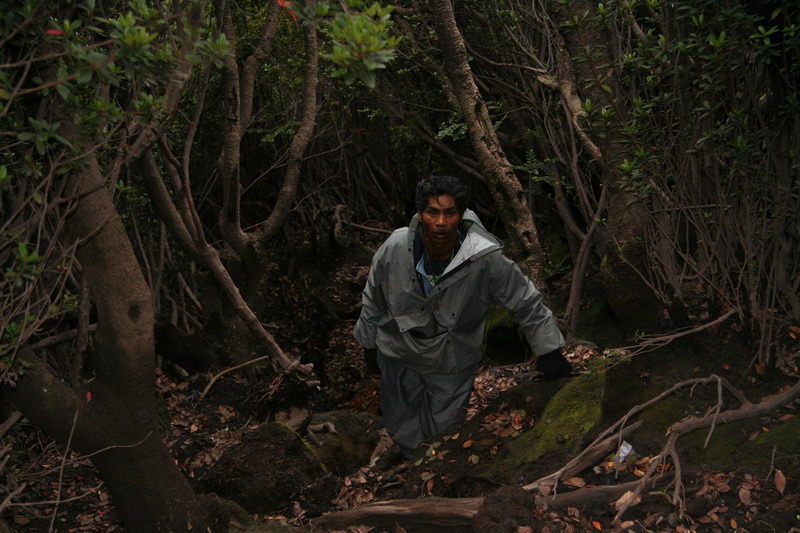 My guide had "vanished" near camp, but I told the porters to tell him that I had started down. It was nice to enjoy this rainforest and very impressive jungle trail without all the rain from yesterday. 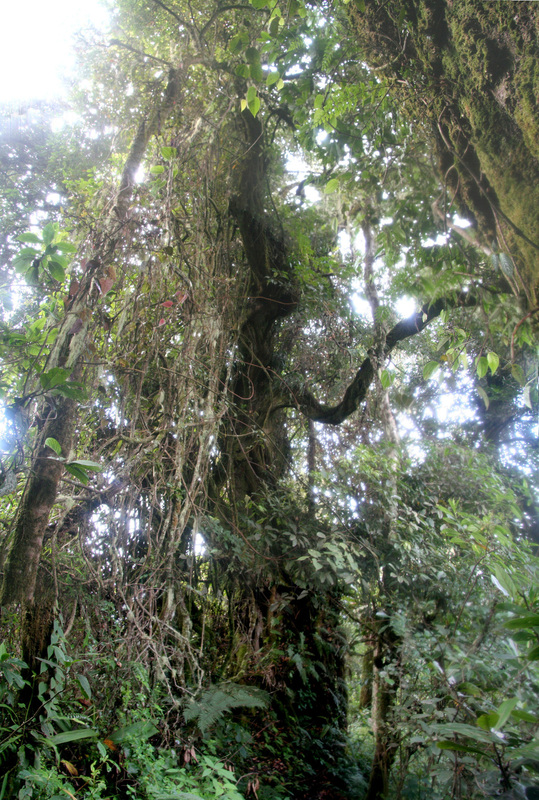 Enormous, impressive trees, and uncountable plants all entangled making off-trail travel close to impossible. I returned to the trailhead at 1015 after a most interesting jungle walk. 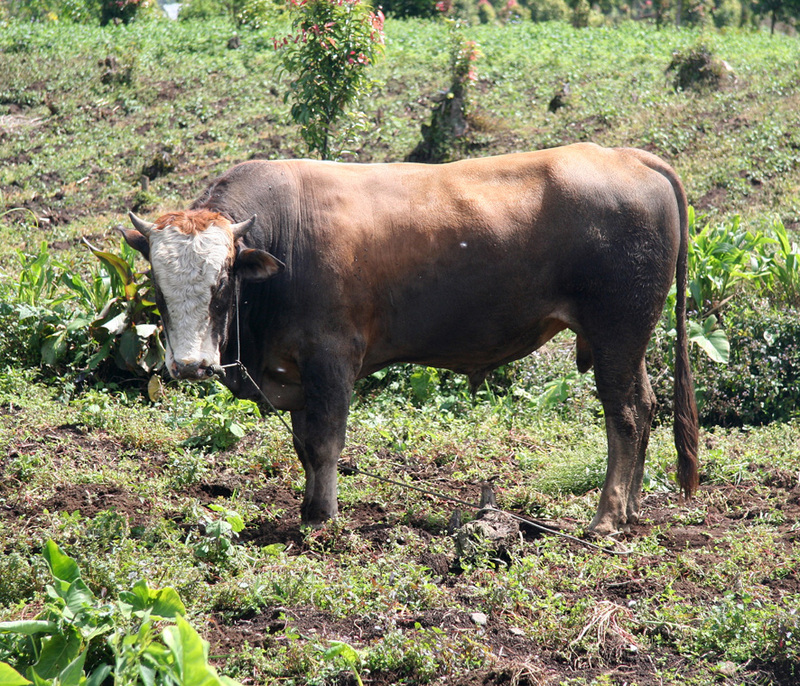 This was considerably earlier than planned, but the weather was good and I looked around on the local farm activities as well as on the local big bull, while walking slowly down the road. Soon, I was approached by a young Indonesian on a motorbike. He wanted to make some extra by driving me back to town. I jumped up behind him, took a good hold around him and off we went. The road was not free of holes and bumps, but only mildly shaken, I arrived back at the Subandi house where I located my driver. I paid for the guide service, got myself a bottle op water and a couple of cans with Coke then prepared to set off. Just as we were about to leave, my guide came down and we waved goodbye, then started the long drive back to Cubadak Island. The drive was about as eventful as the day before, including finding a bypass in a town where the main street was completely blocked by a market. 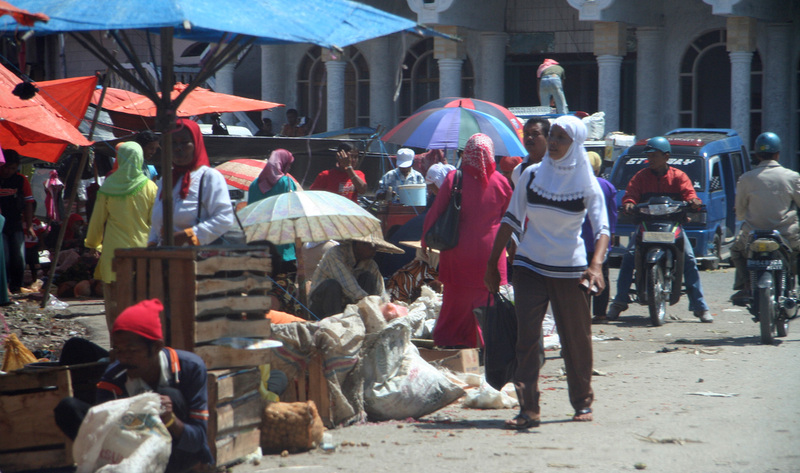 You realize that there are many people in Indonesia when observing the steady stream of people along the roads in the villages that dot the road. We stopped for lunch after about 3.5 hours of driving. An interesting place, clearly serving local demands and staying strictly with Padang cuisine and traditions. At almost no time our table was filled with all kinds of plates, each with a separate dish. I initially was kind of shocked by my driver ordering such huge quanities of food, later I realized that they always serve you every dish that is available, however, you only pay for what you actually taste. Plenty of rice in separate bowls, then a bowl of water in order to rinse/clean your right hand. The left hand should be kept under the table (away from it anyway), while everything from rice to fish, vegetables and meat is eaten directly with your fingers. Not exactly the way I normally have lunch, but it was fun to have tried it once. The food was spicy, but quite nice and the variation great. Including a coke for me, the total bill for two people came to about 7 US dollars and we tasted more than seven dishes. We continued our drive, observing that the first "status symbol" people seem to get is a large satelite dish for TV reception. They were scattered almost everywhere. The next thing is likely a motorbike, my driver told me that one could buy a new one for about 1500 US dollars. Additionally, everybody seems to carry and use a cell phone. This is obvious convenient also for travellers, it was an easy matter for me to send an SMS to Cubadak and ask for a boat pickup at 1730. Thus, before six in the evening I had a good swim in order to rinse and clear the jungle, preparing for an excellent evening meal with Pål Jørgen and Heidi. We spent a few more nice and relaxing days on Cubadak Island, Pål Jørgen cleared all tests and requirements for his Open Water Scubadiving certificate and on his final dive I came along (supervised by the instructor) and we ended up diving to 30 meter exploring a rather steep coral wall with sights of a big ocean turtle as well as numerous good sized tropical fish. We then travelled via Singapore to North-Borneo which belongs to Malaysia. Here, our final mountain on this summer trip should be Kinabalu, the highest peak in South-East Asia. Trail in the jungle. Not much room for a tall hiker. Jungle entrance, the treeline is just above here. One should find this "hole" in order to follow the trail downslope. The final slopes to the summit. The terrain is somewhat steeper than it looks. The summit is visible as the highest point. On the summit. The guide early in the morning.